Our Classic Christmas wreath adds a distinctive touch of holiday elegance to the traditional red and green theme with its luxurious satin red bow and berries. Alive with the evergreen scent of the Cascade forests, the Classic wreath will brighten any place you call home for the holidays. "We are so pleased to have found Christmas Forest years ago. Some of my "senior" relatives so very much enjoy the wreaths that all of the neighbors drop by just for a "whiff" of the evergreens. For others, it is now a tradition for their families to enjoy each and every year. 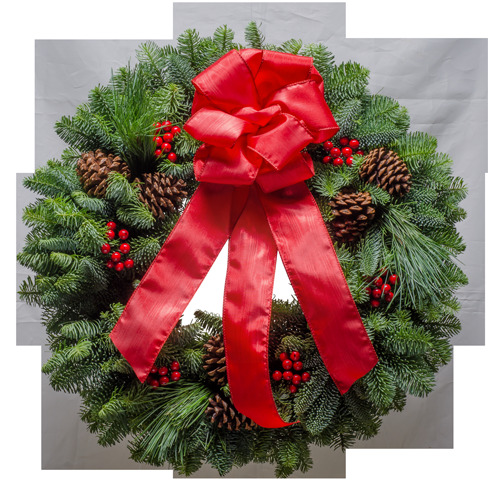 It has been reported that a couple of the wreaths make additional trips/travel to other relatives' homes just for Christmas dinner gatherings, and Christmas morning get togethers."